Oh, hey. The new Team Fortress 2 Spy update is here, revealing the pun-laden list of Steam Achievements for the stealthiest of classes and giving us our very first look at the "Meet The Spy" short. Or not. 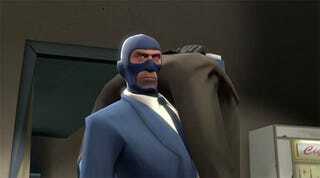 Because "Meet The Spy" leaked this weekend. According to the newest of entries for the Spy update, that leak was due to someone at Valve uploading the hilarious clip to YouTube with the wrong radio button ticked. Oops! Valve comes clean on its very un-Spy like behavior with the first "Valve Corporate Achievement." We shan't spoil. Now let's dig through the list of Achievements to see what we can see. Hmmm.... that gun silhouette in the "Diplomacy" icon looks unusual. And what's going on in that "For Your Eyes Only" Achievement?